INSPIRATION! I found you! It was hiding in the vast tangled forest of the rules and regulations that is standardized testing. You see, I work in a middle school and state testing days are quite an ordeal. The only comparison I can think to make is what a building would have to go through to prepare to receive the president (a lame comparison, I know. I’m still shaking the rust of my inspiration gland). EVERYTHING is considered a threat (to test security), every corner is monitored by highly trained personnel (i.e. the next name on the alphabetized staff roster as duties are assigned), and the event is catered (insofar as you can say that school lunch is a catered affair). My duty was predetermined at conception. Listen, I’m a dude. Society dictates that I potty in a room where only dudes are allowed. Rumor has it that there are similar rooms for chicks, but I’ve never been in one. During state testing, the restrooms have to be monitored. The students like to have think tanks after going potty. Such a clandestine rendezvous might cause a student to score a little higher and help him or her land a job that he/she is not qualified for (before discussing it in the bathroom, he/she thought the square root of 64 was 116, or that George Washington discovered America, or something). Such a forbidden meeting might go like this (it’s funnier if you imagine them speaking in British accents): “The answer to #4 is unequivocally option ‘C. '” Says George. Carl scoffs at this, replies “I’d put ‘C’ if I wanted to get it wrong!” Jim busts in and says, “Will one of you please hurry? I really need to go potty.” He then starts doing the potty hop on one leg. George and Carl, having agreed that the answer is actually ‘D’, have moved on to discussing the merits of multiple choice testing and are too engrossed in the subject to hear Jim’s urgent request to pee (peequest?). Just as they decide that short answer questions would be the best assessment tool, but too difficult to grade, Jim soils himself. Now Jim rushes to finish the test so he can go home to change his pants. He ends up failing the test, and repeats the grade. His self esteem is shot, he stops trying in school, and is forced to take a low paying job at an aerosol can factory. As we all know, aerosol cans deplete the ozone layer – contributing to global warming. In effect, not monitoring the bathrooms during standardized testing contributes to global warming. This brings us back to my conception. In order to prevent cheating, rousing discussions on testing methods, and global warming, the people who create and enforce standardized testing (Satan, Barbra Streisand, Rush Limbaugh, etc.) have decreed that all potties be monitored during standardized testing. As a male, it is altogether fitting and proper that I should do this. Getting back to being I.N.S.P.I.R.E.D (part one HERE), ‘P’ will now stand for “potty monitor”. In keeping with the topic of standardized testing, ‘I’ stands for “Irregularity”. This is a very common, yet much maligned term used for any aberration from testing procedures, which is pretty much everything. I can’t give you an example of a real irregularity – that, in and of itself, would be an irregularity. However, I can tell you that ‘R’ stands for refill. When I write the word ” refill”, you probably think of an icy cold beverage at your favorite local eatery. That is quite far from I’m talking about. I refer, of course, to going to the doctor to refill the pump in your abdomen with that sweet, sweet muscle relaxer called Baclofen – which is 1,000 times stronger than the oral stuff. If you’re unfamiliar with this process, I’ve provided some pictures for you. These shots capture the wide variety of emotions that surface during a refill (read the captions for more info). Prepping for the Poke. Primary emotion – boredom. 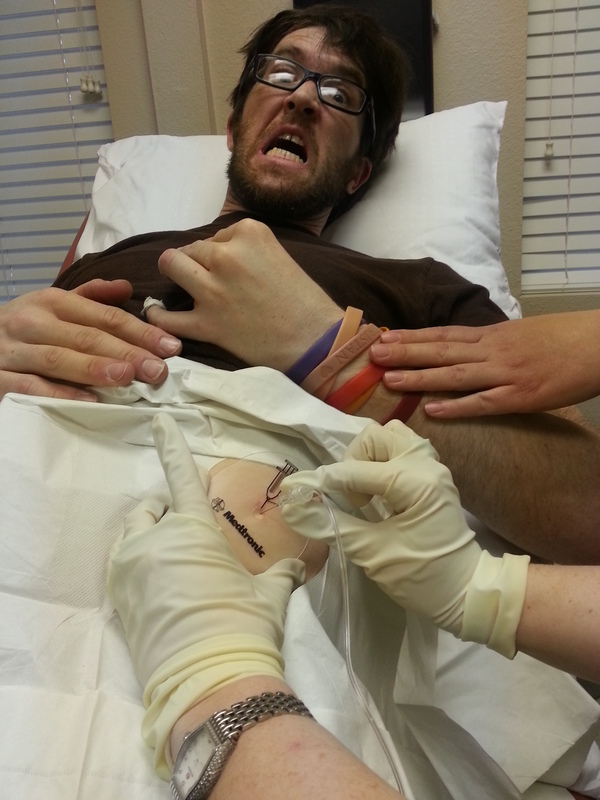 I’ve been stuck with A LOT of needles. 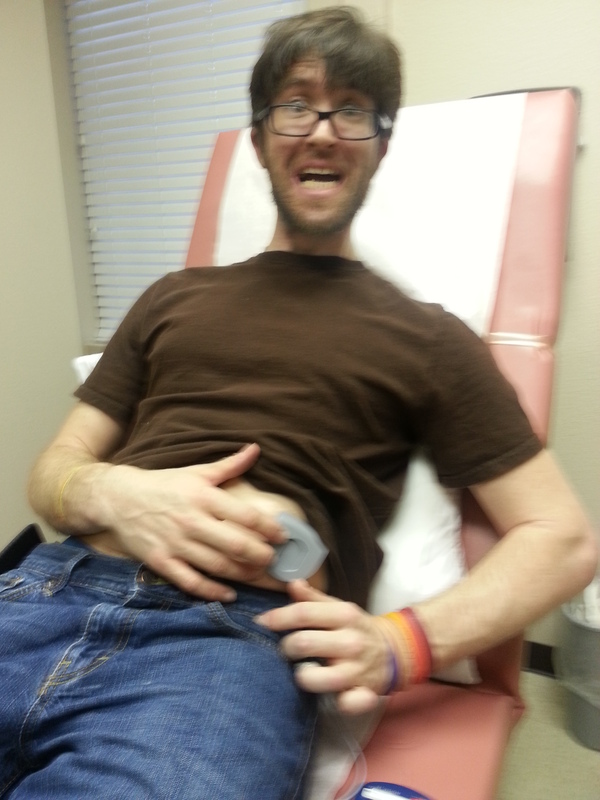 I’m not bragging when I say that getting stuck with a needle is as routine as going potty. The Stick. Primary emotion – rage. Like I said in the previous pic, getting poked doesn’t bother me. If I recall, I was so upset on this particular occasion because they didn’t have any “Where’s Waldo” books in this exam room. Sucking out the old stuff. Primary emotion – stunned sadness. 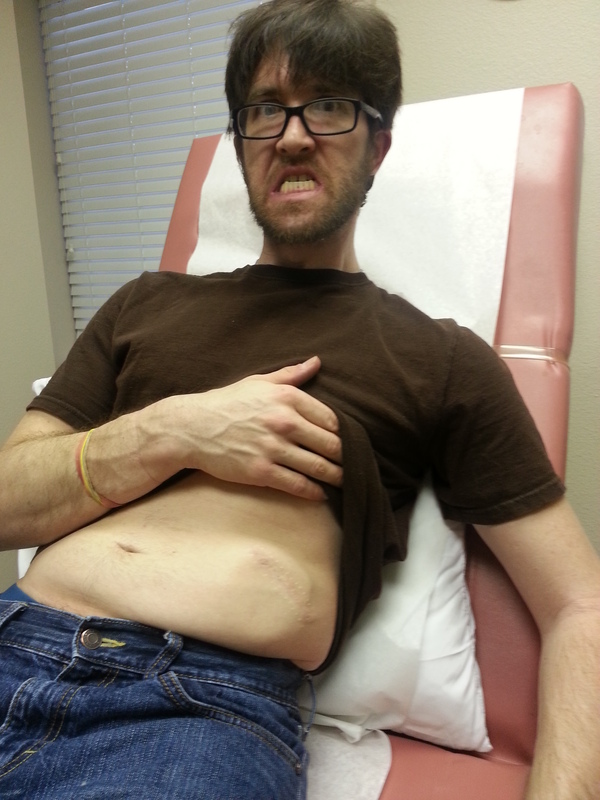 The old Baclofen had been a part of me for a few months, now it’s gone. Funny you mention that. 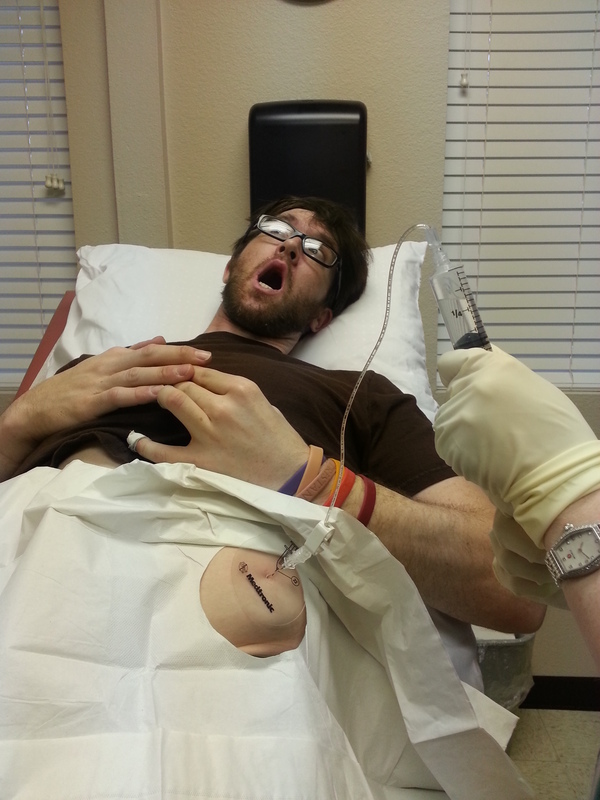 Right now, I’m hooked up at my parent’s house while I recover from surgery tho replace the pump. The battery on my old one was about to die. Batteries can’t be replaced so it’s replaced altogether. Only occurs once every six years or so. Glad you found my blog, I’m always on the fence about keeping up with it, but comments from people like you encourage me to carry on. What is your husband’s name? What happened to him? His name is Sean… He actually just got home about four weeks ago from all the ICU/Acute inpatient/Sub-acute inpatient rehabs…. he is obviously super happy to be home! It is a long medical story (I’m sure you can relate), but effectively a medical issue caused an anoxic brain injury. While diagnosis was poor, he was only 30 at the time so he surpasses our expectations often. I could understand about the blog, it seems like you have been writing for a while. But at the same time, I would think it has to be relatively therapeutic for you to write. And you kinda never know when or how it would help someone — I mean, this post and others look to be back at least 5 years. That is crazy! I do wish they had more on Baclofen pump information. Here is a link to search results related to the pump – https://braininjourney.com/?s=Baclofen+pump – please don’t hesitate to ask if you have a question. You’re right about the dearth of information – it’s either Medtronic telling you how great the pumps are, or some guys very negative experience with it. To be fair, I’ve had my share of problems with it – when I first got it my spine started leaking csf – wreaking all kinds of havoc – I thought I blogged about it, but I don’t see anything substantial, there are several entries that make reference to “blood patch” – which is the fix for such a problem. 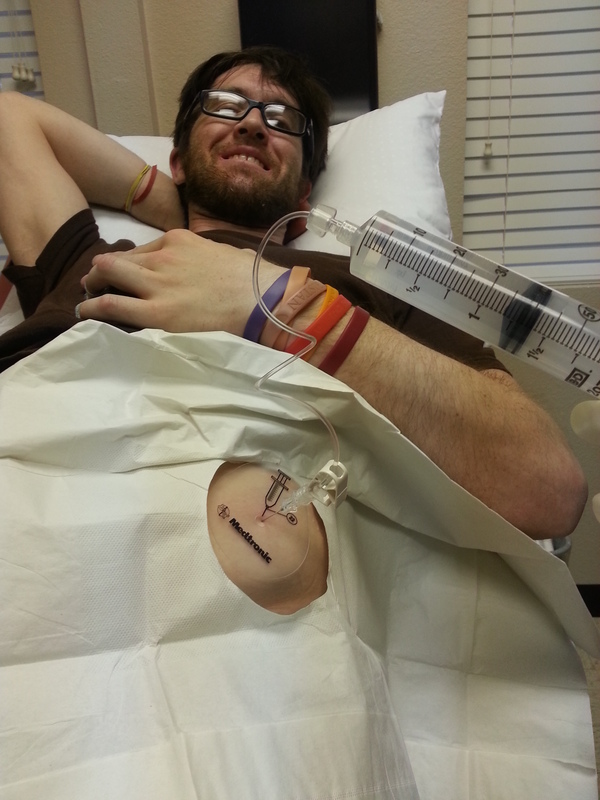 To get a better idea of life with a Baclofen pump, read here: https://braininjourney.com/2017/10/01/dialectical-menialisms-iii-backlofen-and-forth/. 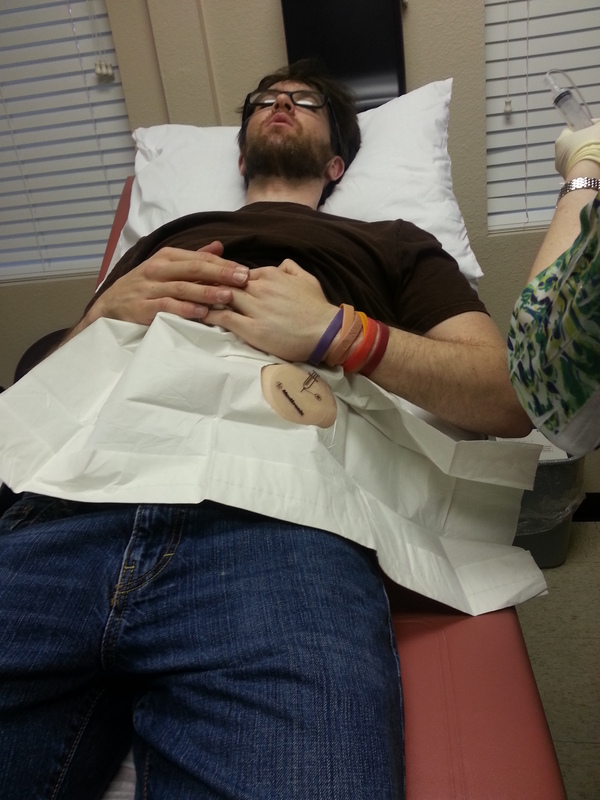 I can’t believe I didn’t write details about the blood patch and whatnot, I will do it now!